The premise: An elderly couple, slightly lonely, wants to adopt of kitten. Who doesn't? So, the old man goes to pick out a cat from the valley of cats (apparently). And every cat he sees is so cute, just too cute to leave behind. Eventually has has ALL of them following him home. 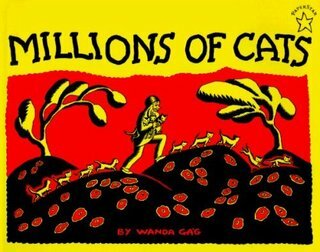 Hundreds of cats, thousands of cats, millions and billions and trillions of cats. The gray one and the black one and the big one and the spotted one. You get the idea. Anyway, that's how I am with books. I am a shameless book hussy. I'll read almost anything (as long as it hasn't been recommended by Dr. Hill... haha). For example, consider my bedside table. I'm fairly certain that there is or was a lamp on it at some point, but it's long been blocked from my view by piles of books. Each one with a different makeshift bookmark or a bent page at some mid-point. Most have scribbled thoughts or smileys or underlines in them, all shades of ink, all impressions of my reading. And I love them all. The Writing Life , Annie Dillard. This is one of the best written books about writing by a current American author. That may sound awfully qualified to you, but it's a lovely read and that's why I've worked my way through it multiple times. In fact, I am completely unqualified to write about Dillard's writing about writing... so, I'll let her do it. "The page, the page, that eternal blankness, the blankness of eternity which you cover slowly, affirming time's scrawl as a right and your daring as necessity; the page, which you cover woodenly, ruining it, but asserting your freedom and power to act, acknowledging that you ruin everything you touch but touching it nevertheless, because acting is better than being her in mere opacity; the page which you cover slowly with the crabbed thread of your gut... that page will teach you to write." Selected Short Stories of William Faulkner . Currently I'm working through Barn Burning, one of the inspirations for The Long, Hot Summer (1958) starring Paul Newman. Faulkner is dialect heavy and has fun playing with his readers via the tortured thought processes of his protagonists. I'm enjoying this thick, tough-skinned look at the poor South in the pre-war years. His writing is very masculine, brooding, though self-absorbed. Hey, some people have earned the right to arrogance. We Band of Angels , Elizabeth Norman. On a hunt for stories about the WWII home front, I came upon this recently penned memoir which is tagged "The untold story of American nurses trapped on Bataan by the Japanese." This is one of my favorite war stories. Just after the attack at Pearl Harbor, American military positions in the Philippines came under siege. More than 100 American Army and Navy nurses were pushed back into the concrete tunnels of Bataan and Corregidor. While a couple of dozen were evacuated in secret before the troops surrendered, more than 70 were taken to Japanese prison camps. In 1943, Hollywood honored those nurses, both the lucky ones who made it back to the states and the unlucky, still imprisoned and thought to be dead (though I believe all of them survived the prison camps). The movie, So Proudly We Hail starred an impressive cast of the best-known and best-loved starlets of the time. Not only did Claudette Colbert and Paulette Goddard earn critical acclaim, Veronica Lake took on the role of Olivia, a nurse with a personal vendetta against the Japanese who eventually sacrifices herself for the sake of her sister angels in white. Lake even agreed to wear here hair back from her face and under her helmet, abandoning the sultry, long bangs that made her famous, in support of the war effort. The book, which I just delved into yesterday, has me rapt and fascinated on another level now. Author Elizabeth Norman's sophisticated impressions of life on the islands, the sense of duty and honor and bravery, has been strung together after her vast amounts of research and interviews with 20 of the surviving nurses. It's beautiful in style and in substance. Dream Catcher: A Memoir , Margaret Salinger. A biography/memoir of famed American author, J.D. Salinger (of The Catcher In the Rye, a book favored by American high school curriculums for it's timeless impression of teenage angst and the passionate aimlessness it inspires) is authored by his daughter, Peggy. It is written with equal parts tenderness and sincerity, a complex balancing act considering her dad had some major issues. For instance, he was constantly thirsting for a spiritual enlightenment that took him through every "ism" known to man. He compulsively controlled the behavior of his wives and girlfriends. But there is a mysterious darkness about Jerome "Sonny" Salinger, more intriguing than foreboding, that comes through brilliantly in Margaret Salinger's analysis of her father's life, mindset and habits when considered through the lens of his own writings. Pilgrom at Tinker Creek , Annie Dillard. The depth and point and beauty of this Pulitzer Prize winning work of the aforementioned Annie Dillard has eluded me in the past. Every paragraph is deluge of language, a barage of vocabulary. However, this time I'm in for the long haul. I made it through the scene with the "Giant water bug" without gagging and high-tailing it for something cheerier. Like so many things in life, this work can only be enjoyed for exactly what it is. If you're looking for a book to suit a need or to speak to your soul on a specific occasion, skip this one. Dillard is a master of observation. From weather to terrain to a dead sack of frog skin lilting to the bottom of a creek after the frog's dissolved organs and bones have been sucked out like a smoothie, "reduced to juice" by the Giant water bug... she does it all with a perfectly placed multi-syllabic word which the most learned among us must look up before we can go on! I have discovered that her writing style is quite soothing at the end of day, though. It's not a breakfast book, to be sure, because she'll lose you immediately in the grandness of her own thoughts. But at the end, after all the busy work of day, time spent at a desk and keyboard, the frantic motions which we consider part and parcel with life in general, giving way to the gentle vibration of Dillard's calm, considerate prose, letting it overtake you, picturing the sky and the clouds and Tinker Mountain, it's your ticket to soft dreams and deep sleep. Also on my nightstand are Edward Abbey's Desert Solitaire (for those times when loneliness actually sounds appealing), a multi-chapter excerpt from famed classic actress Bette Davis' autobiography, The Lonely Life, and Red Sky at Morning by Richard Bradford, a classic coming-of-age story set in WWII-era New Mexico. So, going back to my millions-of-cats analogy, I sometimes worry that the immense stack of literature will topple at some inopportune moment and clock me on the head... perhaps as I sleep! Like the countless heard of cats which the old man brings home to his wife, what if these zillions of books drink the rivers and ponds dry?! Or destroy the farmland in their ferocious hunger?! But that's just my wild imagination talking. On nights when I'm overwhelmed by the stack of them, looming at my right, I wish I could let the books decide among themselves who gets to stay and who must be destroyed. I wonder which of these fantastic works I would want to find huddled under a bush, mewing after the fur and claws had chaos had settled. It would be a tough call. Just please don't make me choose! Consider a boiled skull on a table.